Due to growth within our company we are currently seeking appli cations from experienced sports, dance and fitness coaches to join our friendly team. Shifts currently available are as follows. Bring it on Sports are very excited and proud to announce we now have our first ever Australian school participating in TACKLE GRIDIRON for sports. 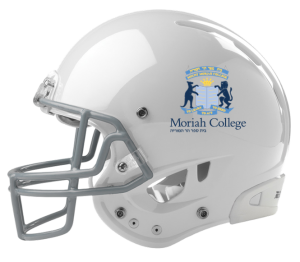 Inspired by Jarryd Hayne’s move to the NFL and growing interest in the sport locally, Moriah College in Sydney, is actually the first school in Australia to introduce Tackle Gridiron (American Football) to their sports curriculum. Over the coming weeks, the students will receive their helmets and shoulder pads and will be coached to learn the skills of tackling, snapping, throwing and blocking. Coach Paul Manera and the staff at Bring it on Sports are looking forward to expanding tackle football into neighbouring schools to create an Eastern Suburbs Schools Competition – a first for Australia. If you would like to introduce Tackle Football to your school email us! SCHOOL SPORTS – Regular participation in sport and physical activity is associated with a range of physical and mental health benefits both in childhood and adulthood. Active children generally become healthy adults and schools play a key role in contributing to that outcome. Bring it on Sports are strong believers that sport provides a vehicle for a number of social, physical, emotional and moral learnings. In school sport the prime concern is to give all students the opportunity for participation, enjoyment and skills development. Bring it on Sports has been chosen as one of five professional sports providers to deliver the Cricket NSW programs in NSW schools for the 2014/2015 cricket season. Cricket NSW is embarking on a program which will enable thousands of primary and high school children the opportunity to engage in cricket programs for years to come. If you like Oz Tag you’ll LOVE Flag Gridiron! Flag Gridiron (or Flag Football) is a modified version of tackle American football. Instead of tackling players to the ground, the defensive team tackles a player by pulling their flag or flag belt. The object of the game is to score touchdowns by advancing the ball up the field by running or throwing the ball, and crossing the end zone line. In the USA, American football has been played since the mid-1800s. The first college game of football occurred between Princeton and Rutgers in 1895. The game of flag football has been around for as nearly as long as tackle football. Flag football was played as a recreational activity for American military personal in the 1940s. Recreational leagues began in the USA in the 1940s and 50s. Flag Gridiron requires each player to have a flag or flag belt, an American football, and cones to designate the end zones. No helmets or shoulder pads are allowed. Good flag gridiron players can start, stop, and change directions quickly. Players can work on their agility by running round cones, and jumping rope. Anyone can play Flag Gridiron! Men, women and children! Australian school children rank among the worst in the world for overall physical activity levels, narrowly avoiding a FAIL in a new national report card. Supported by the National Heart Foundation of Australia and Exercise and Sports Science Australia, the inaugural Active Healthy Kids Australia Report Card on Physical Activity for Children and Youth has found 80% of 5-17 year olds are not meeting the Australian physical activity guidelines of at least 60 minutes of exercise each day. The Report Card on Physical Activity has been compiled in the hope that it will help inform the nation on how active our children and young people really are. The vision is to update the Report Card annually and continue to collate emerging research and trends to “score” the nation on the levels of physical activity in children and young people. Report author Natasha Schranz, PhD from the University of South Australia said too many Australian parents believe playing sport is enough to keep their kids healthy. “Australia is a sporting nation, and vast numbers of children are involved in some type of organised sport but this report clearly shows we need to be looking at further ways to keep kids active when they are not on the sports field,” Dr Schranz said. The Heart Foundation’s National Lead on Active Living, Associate Professor Trevor Shilton said the evidence can’t be ignored. “We’re raising a generation of couch potatoes and if we don’t start to reverse this trend this will drive up health problems in the future – obesity, high blood pressure and heart disease,” he said. Badminton is a racquet sport played by either two opposing players (singles) or two opposing pairs (doubles), who take positions on opposite halves of a rectangular court divided by a net. Players score points by striking a shuttlecock with their racquet so that it passes over the net and lands in their opponents’ half of the court. Each side may only strike the shuttlecock once before it passes over the net. A rally ends once the shuttlecock has struck the floor. Because of the way that the shuttlecock floats in the air, badminton makes for a great sport to introduce racquets to kids of all ages and abilities. There are easy adaptations, including lowering the net or removing it all together. 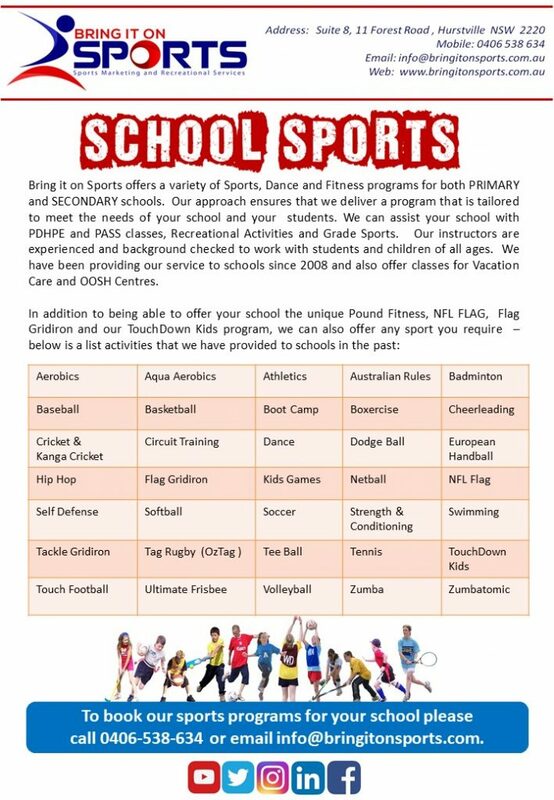 To book Bring it on Sports for your school please contact us. #bringitonsports #schoolsports #Badminton.